It has been almost two years since I was playing with TensorFlow based Morse decoder. This is a long time in the rapidly moving Machine Learning field. 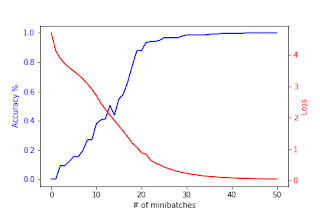 I created a new version of the LSTM Dynamic RNN based Morse decoder using TensorFlow package and Aymeric Damien's example. This version is much faster and has also ability to train/decode on variable length sequences. The training and testing sets are generated from sample text files on the fly, I included the Python library and the new TensorFlow code in my Github page. The demo has ability to train and test using datasets with noise embedded. 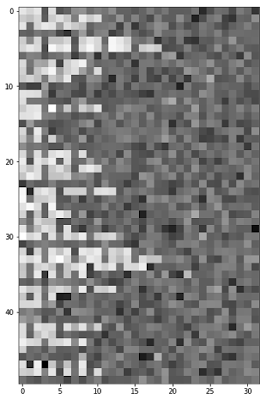 Fig 1. shows the 50 first test vectors with gaussian noise added. Each vector is padded to 32 values. 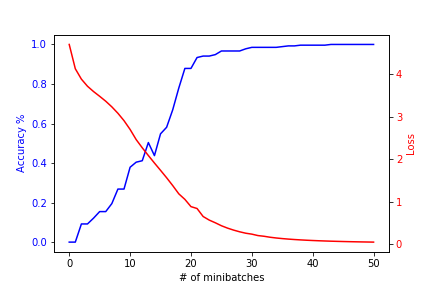 Unlike the previous version of LSTM network this new version has ability to train variable length sequences. The Morse class handles the generation of training vectors based on input text file that contains randomized text. Fig 1. "NOW 20 WPM TEXT IS FROM JANUARY 2015 QST PAGE 56 "
Fig 2. shows the training loss and accuracy by minibatch. This training took 446.9 seconds and final testing accuracy reached was 0.9988. This training session was done without any noise in the training dataset. Fig 2. Training Loss and Accuracy plot. As the reader can observe the LSTM network has learned near perfectly to translate incoming Morse sequences to text. Interestingly this text is still quite readable despite noisy signals. The model seems to mis-decode some dits and dahs but the word structure is still visible. As a next step I re-trained the network using the same amount of noise in the training dataset. I expected the loss and accuracy to be worse. 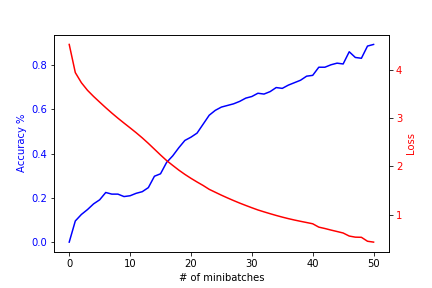 Fig 3. shows that training accuracy to 0.89338 took much longer and maximum testing accuracy was only 0.9837. As reader can observe now we have nearly perfect copy from noisy testing data. The LSTM network has gained ability to pick-up the signals from noise. Note that training data and testing data are two completely separate datasets. Recurrent Neural Networks have gained a lot of momentum over the last 2 years. LSTM type networks are used in machine learning systems, like Google Translate, that can translate one sequence of characters to another language efficiently and accurately. This experiment shows that a relatively small TensorFlow based neural network can learn Morse code sequences and translate them to text. This experiment shows also that adding noise to the training data will slow down the learning rate and will impact overall training accuracy achieved. However, applying similar noise level in the testing phase will significantly improve the testing accuracy when using a model trained under noisy training signals. The network has learned the signal distribution and is able to decode more accurately. So what are the practical implications of this work? With some signal pre-processing LSTM RNN could provide a self learning Morse decoder that only needs a set of labeled audio files to learn a particular set of sequences. With large enough training dataset the model could achieve over 95% accuracy.